Okay, so if you've ever had some time to yourself online, you've surely clicked a link....and that link probably lead you to another link....and another and another. We've already mentioned this once in the last few hours here, but I felt the need to say it again, simply because that's exactly what lead me to my disastrous discovery of the song currently going through my head. Horny Rhino lead me to Yahoo to search for straight jackets as "I'm horny...horny, horny, horny" played through my head repeatedly. 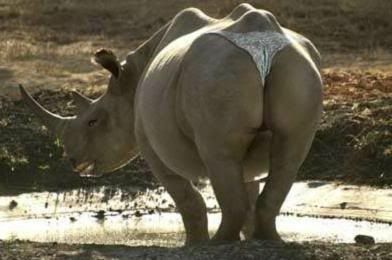 So thank you, dear Space Monkey Pants, for inadvertently enlightening me to the world of horny rhinos.